Diet and lifestyle have a major influence on the development of hypertension. In addition to genetic predisposition and pre-existing conditions such as diabetes mellitus type 2 and kidney disease, a high consumption of alcohol, tobacco, salt, and saturated fatty acids play a role as risk factors. On the other hand, regular exercise, a body weight in the ideal range, and an adequate supply of potassium can reduce blood pressure. A well-planned diet can therefore guard against the development of hypertension and be used to treat the condition. 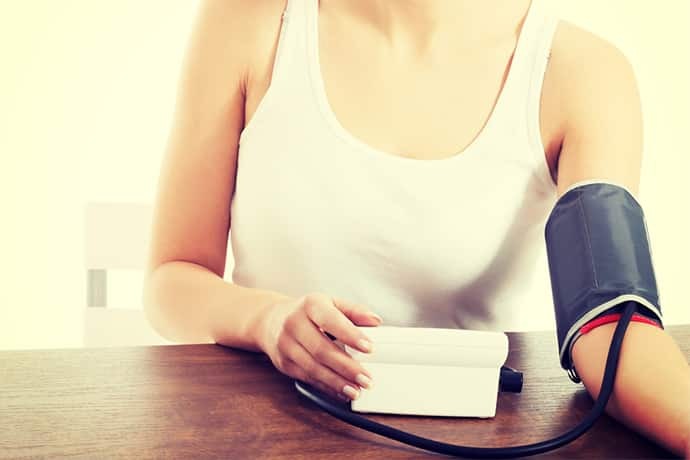 Several studies have shown that there is a correlation between the consumption of red meat and high blood pressure.14Austin J Pulm Respir Med (2015): Does Red Meat Metabolism Induce Hypertension? Available at http://austinpublishinggroup.com/pulmonary-respiratory-medicine/fulltext/ajprm-v2-id1019.php [14.03.2018] 15Ophir, O., Peer, G., Gilad, J., Blum, M., Aviram, A. (1983): Low blood pressure in vegetarians: The possible role of potassium. Am J Clin Nutr. 37(5):755-62. Available at https://www.ncbi.nlm.nih.gov/pubmed/6846214 [14.03.2018] In addition to foods containing large amounts of saturated fatty acids, a high consumption of sodium, salt, or cholesterol also has a negative effect on blood pressure. Cholesterol can accumulate on the walls of blood vessels, resulting in a loss of flexibility.16Schorling, E., Niebuhr, D., Kroke, A. (2017): Cost-effectiveness of salt reduction to prevent hypertension and CVD: a systematic review. Public Health Nutr;20(11):1993–2003. Available at http://www.ncbi.nlm.nih.gov/pubmed/28487006 [14.03.2018] 17Harris, I. & Lipkin, I. J. (1930): High blood pressure and cholesterin. Br Med J. 1(3612): 587–588. Available at https://www.ncbi.nlm.nih.gov/pmc/articles/PMC2313010/pdf/brmedj07485-0011.pdf [14.03.2018] Processed animal products, in particular, such as cheese, sausage, other meat products, and ready meals, are often very rich in salt, fat, and cholesterol. Rapeseed oil, linseeds, and linseed oil, can also reduce blood pressure25Rodriguez-Leyva, D., Bassett, C. M. C., McCullough, R. & Pierce, G. N. (2010):The cardiovascular effects of flaxseed and its omega-3 fatty acid, alpha-linolenic acid. Can J Cardiol. 26(9): 489–496. People who do not consume meat and other animal products usually have a healthy body weight, are physically active, and follow a varied diet high in fruits and vegetables.28Tonstad, S., Butler, T., Yan, R. & Fraser, G. E. (2009): Type of vegetarian diet, body weight, and prevalence of type 2 diabetes. Diabetes Care. American Diabetes Association. ;32(5):791-6. doi: 10.2337/dc08-1886. Epub 2009 Apr 7. Available at http://www.ncbi.nlm.nih.gov/pubmed/19351712 [14.03.2018] Vegetarian/vegan lifestyles are therefore not only suitable for preventing high blood pressure, but also for treating it.29Alexander, S., Ostfeld, R. J., Allen, K. & Williams, K. A. (2017): A plant-based diet and hypertension. J Geriatr Cardiol. 14(5): 327–330. doi: 10.11909/j.issn.1671-5411.2017.05.014. Available at https://www.ncbi.nlm.nih.gov/pmc/articles/PMC5466938/ [14.03.2018] Switching to a plant-based diet is a natural way to lower blood pressure. Eat a diet rich in fruit and vegetables, particularly those containing high levels of potassium and magnesium. Try to choose vegetable protein. Reduce the intake of saturated fatty acids and cholesterol. Instead, aim for a higher amount of monounsaturated and polyunsaturated fatty acids. Avoid cigarettes and alcohol as far as possible. Engage in sufficient physical activity. 25. ↑ Rodriguez-Leyva, D., Bassett, C. M. C., McCullough, R. & Pierce, G. N. (2010):The cardiovascular effects of flaxseed and its omega-3 fatty acid, alpha-linolenic acid. Can J Cardiol. 26(9): 489–496.